Back in 2009, we launched this blog to chronicle our initial journey the Jack Daniels World Championship Invitational Barbecue Competition - aka "The Jack.". Billed as the "World Championship of Barbecue", this epicurean "Superbowl" is held in the sleepy little hollow of Lynchburg, TN (pop.361) the 4th Saturday in October each year. It just so happens that Lynchburg is also home to the world renowned Jack Daniels distillery - the primary sponsor and namesake behind this culinary extravaganza. Each year, tens of thousands of competition BBQ teams from across the United States (and around the world) spend countless hours and weekends competing in sanctioned BBQ events. These teams vie not only for Grand Championships & serious prize money (sometimes as much as $100K) - but perhaps even more importantly, they are all hoping by the end of the "BBQ season" to grab one of the 60 highly coveted spots to cook against an elite group of teams for the title of "world's best" (the "Jack" is by invitation only). 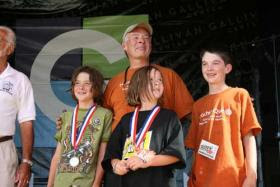 We competed in the 2009 Jack, and finished in the "middle of the pack" - an accomplishment we were certainly proud of. And after more or less taking the year off in 2010, "Hoochie-Que" is ramping up to make another run at a coveted invitation to the Jack in 2011. So, after over a year of "neglect", we are "dusting off" this little ol' blog to once again share with family, friends, and other BBQ cooks/fans our experiences as we start our journey hopefully towards another invitation to the "Jack" in October 2011. Also - and especially if you are new to this blog - make certain to read back through the "Blog Archive" to re-visit our experiences and trip to the Jack back in 2009! Some pretty good writing, memories & photos if I do say so myself! Thanks - and we hope to see you in Lynchburg on October! 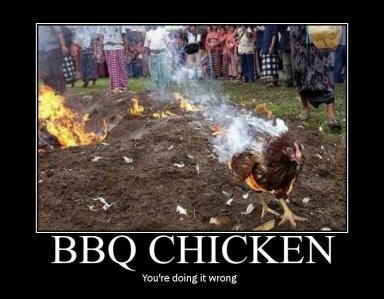 Just a quick update from the WestX BBQ comp down in St. George this past weekend. 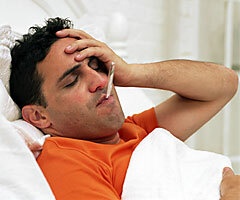 Well, despite the best of intentions - and yes, Mom, I did go get my flu shot this year - I came down with the flu and a 102 degree fever the Wednesday before we were due to head to Santa Fe to compete in the Sam's Club National BBQ Tour event. We had been in Dallas the week before at a dental meeting, and perhaps I picked up the "bug" there and/or while on the plane trip... Regardless, we were more than bummed to miss out on this event!! There were some great teams/friends there - some of the best in competition BBQ - that I was looking forward to seeing again and competing against - Johnny & Trish Trigg with Smokin' Triggers, Vince & Alexa with Rhythm N Que, Glenn with IAB 30 BBQ, Garry with The Smoke Ring, Sweet Peppers, and Carcass Cookers among others. "Strange" and unfamiliar names to the general public I know - but great teams and wonderful people well-known to those of us on the competition BBQ circuit. So now our next opportunity to get "off & running" for the 2011 season will be the WestX Western Festival & BBQ competition to be held in St. George, UT on May 13-14. This competition, while smaller than the one in Santa Fe, will still feature some great talent including one of the best & hottest teams in Utah right now (R&R BBQ), along with a national "celebrity" BBQ team - Harry Soo & Slap Yo Daddy BBQ from California. It will be a great event, and we are ready to get out there and get our feet wet. It will also be good to get that first competition of the year behind us, too, and there are always "butterflies" at the start of the year. Dr. Michael Knight (aka "Hoochie") - is a Park City, Utah dentist during the week - and a BBQ fanatic on the weekend! A native Texan, he has been smoking Que for family & friends for over 15 years. He and his wife (Dr. Venssa Knight) and their kids (the "Little Hoochies") have also been competing professionally since 2006 - and their competition team "Hoochie-Que" has won numerous awards. In 2009, they became the first team ever from Utah to earn an invitation to the prestigious Jack Daniels World Championship Invitational BBQ competition - and they are still the only Utah team to hold that honor. 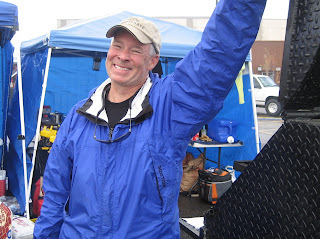 Dr. Mike is also a KCBS Certified Barbecue Judge (CBJ).